One of the best parts of owning books is sharing them. I’ve always enjoyed that, especially if it’s a book I really like and the person with whom I share it really likes it, too! But the problem is that I often forgot who has the books I lent, and then I go looking for them and wonder where they are. My almost 102 year-old aunt has always enjoyed reading. It’s hard for her hold a book now, and her care-givers read to her. So sometimes I think of books she might enjoy and take them to her. 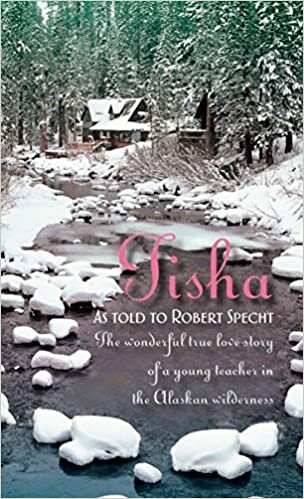 She was an elementary school teacher, so I thought she might like a book called Tisha. It’s the story of a young (19) year-old teacher who ventures into Alaska in 1927. It’s a true story that was told to the author, Robert Specht. Tisha teaches in Chicken, Alaska, east of Fairbanks near the border with the Yukon Territory. It was named “Chicken” because the couple of miners who settled there saw a lot of ptarmigans running around and thought they were chickens! It’s a sweet story, well-written, and very revealing about the conditions and attitudes of the time. The teacher’s name was Ann Hobbs and her courage, commitment, and curiosity make her story a great (and fast) read. So I’ve been looking from time to time for this book in various places in our house, and I cannot find it. I loaned to someone sometime. I hope it has continued to be shared with others. Who knows? Maybe I loaned it to my aunt years ago, and it’s somewhere in her house. When you’re almost 102 you can’t remember what you’ve read or not read, so every book is a new adventure! I recommend Tisha as a new adventure for all of you!